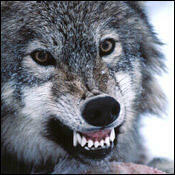 A snarling wolf reveals its deadly array of teeth. As omnivores, canids need a variety of specialized teeth to eat the different types of foods in their varied diets. Canids, including domestic dogs, have 42 teeth, although there are a few exceptions: The bat-eared fox has 48. Two rows of six small, curved incisors help the dog maintain a firm grip on prey, while four large, pointed canine teeth tear at it. Sixteen sharp premolars, including the carnassials, allow the dog to cut and slice flesh, while 10 powerful, grinding molars mean the dog can chew the non-flesh parts of its diet -- typically vegetables, other vegetation and grains. Nutrients, or food, enter the body via the mouth. Teeth line the upper and lower jaws and are used for tearing and shredding food. Puppies have 28 teeth, while adults have 42. The exact number can vary slightly. The teeth are living tissue and are covered with enamel, the hardest substance in the dog's or cat's body. Dentine is the next layer, and the core is called the pulp. The pulp contains blood vessels and nerves which nourish the teeth. The root of the tooth is buried beneath the gum. Some teeth, such as incisors, have one root, while the others, such as the upper fourth premolars, have as many as three roots. Saliva produced by salivary glands is mixed with food in the mouth. Saliva acts as a lubricant and contains ptyalin, an enzyme which helps break down starch in the diet. The dog has four pairs of salivary glands. The parotid, mandibular, sublingual, and zygomatic all produce saliva. Each gland has its own duct to carry saliva from the gland to the mouth cavity. The tongue of a dog is a complex organ. It is used to manipulate food about the mouth and it allows the animal to drink water. In a dog, when drinking water, the water is transported from under the tongue into the mouth. Contrast this to a feline that laps water on top of the tongue. When cats drink it is relatively silent, while a dog must repeatedly thrust its tongue into the water to gulp it up. Gulping is noisy. While gulping water, much air can be transported along with the liquid, making hiccups a common occurrence, especially in puppies. The tongue is covered with taste buds which aid in recognition of flavors. The tongue of a dog is also used for cleaning the body as well as communicating with other dogs. The gums in dogs vary greatly in normal coloration or pigmentation. Most breeds have pink gums. However, some breeds such as Chow Chows have deep blue-black gums. In some cases, the inner cheeks as well as the tongue are also darkly colored. Bad breath, medically termed 'halitosis', is a common problem reported by pet owners. The most common cause of halitosis is some sort of dental problem. Bacteria, saliva and food particles can form plaque, which causes bad breath. This can further develop into gingivitis, or worse, periodontal disease, which will make the breath even more unpleasant. Any pet with bad breath should be examined by a veterinarian, unless you know it's caused by something the pet ate. Some causes of bad breath can cause severe and even fatal complications if not treated promptly. Cleft palate is a skeletal disorder occasionally seen in puppies of all breeds. A cleft palate results when the bones forming the roof of the mouth do not grow normally. This results in an opening in the roof of the mouth that communicates with the nasal cavity. Puppies as young as one day old will often have milk come out their noses as they nurse. They may also inhale milk into their lungs, causing a difficulty in breathing or even pneumonia. When the puppy's mouth is examined, a slit will be seen in the roof of the mouth. The milk tends to enter the nasal passages and lungs. Most puppies will die at an early age from pneumonia and/or malnourishment. Mild openings in the mouth roof can be surgically corrected. More severe instances cannot. Frequently, if the cleft palate cannot be surgically closed, euthanasia is advised. Puppies, because of their chewing nature, sometimes get foreign bodies lodged in their mouths. Bones and sticks, poultry and pork chop bones are common offenders. Commonly the objects are lodged across the upper palate between the teeth. Drooling and gagging are the most noted symptoms. Dogs are usually not really gagging, but rather manipulating their tongues in an attempt to remove the object. A foul breath odor will develop if the objects remain lodged. Many of these dogs will not eat, while others go on as if nothing is wrong. Some dogs will paw at their faces or rub their faces on the ground. If the objects are not promptly removed they may cause infections of the gums and other structures. Many patients fail to eat and lose weight. Puppies have 28 temporary teeth, 14 in the upper jaw and 14 in the lower jaw. These deciduous teeth erupt at about three to four weeks of age. Dogs have 42 permanent teeth, 20 on the top, and 22 on the bottom. These begin to emerge at about four months of age. Dogs have 6 permanent teeth that have 3 roots each, and 14 teeth that each have 2 roots. Puppies should lose a puppy tooth before the corresponding adult tooth emerges. If a puppy tooth is still in place when an adult tooth begins to show it is called a retained decidious tooth. If this occurs, see your veterinarian so the dog's occlusion is not affected. Studies show that by age three, 80 percent of dogs exhibit signs of gum disease. Symptoms include yellow and brown buildup of tartar along the gumline, red inflamed gums, and persistent bad breath. Facial swelling below the eye is usually due to an infection of the 4th premolar (carnassial) tooth. Sneezing and nasal discharge may be due to an infection of the upper canine tooth. The infection may lead to an opening between the mouth and the nasal cavity. This is called an oronasal fistula. Small dog breeds are more likely to develop periodontal disease than large dogs because the teeth of small dogs are often too large for their mouths, according to veterinary dentistry experts. A broken tooth is a common problem, especially among outdoor dogs. The canine teeth of working dogs are essential to allowing the dogs to carry prey and other objects. If these teeth become broken, a canine dentist can prepare a metal crown. We frequently see canine patients at our clinic with a huge fluid filled cyst located either under their jaw or within their mouth. When we say huge, we really mean what we say because some of those found below the lower jaw are larger than grapefruits. There are many other causes of swelling in this area such as puncture wounds, abscesses, infections of the teeth, and tumors, but most common relate to the salivary glands. The salivary glands, as their name implies, are responsible for the production of saliva. Several sets of them lie in the tissue area beneath the skin in the upper and lower jaw. Saliva production goes on constantly. It continuously makes its way into the mouth through small ducts that originate within the salivary glands and course under the skin, opening directly into the oral cavity. The purpose of saliva is to lubricate the mouth, moisten the food, and begin the digestive process. Saliva breaks down starch into individual sugar molecules, both within the mouth and during chewing, and later on in the stomach and small intestine. Salivary cysts occur when saliva leaks from the salivary ducts into the tissues near or within the mouth. This may be caused simply by trauma to the ducts. In some instances, the duct may have been broken or it may have been bruised with the resultant swelling closing off the duct. In other cases, an abscess or tumor in the area may put enough outside pressure on the duct to pinch it off as you might a garden hose. Finally, there are instances when the glands, because of an internal inflammatory process, release a fluid that is just too thick to make its way through the tiny ducts. This again leads to an obstruction. All of these cases have the same final result. Whether the duct was originally ruptured or not, the pressure of continued saliva production by the glands will finally cause the walls of these tiny tubes to break and allow saliva to leak into the surrounding tissue. A small amount of a fluid leaking into tissue rarely, if ever, causes a problem and will usually go unnoticed. We often give large quantities of fluids directly under the skin to a dehydrated puppy or kitten. (It is sometimes impossible to find a vein in these tiny animals for the preferred intravenous route.) It is absorbed by the blood system in a few hours and distributed throughout the body. However, saliva leaking into the tissues almost always develops into a major problem because the fluid is produced constantly and in large quantities. Additionally, possibly because of the viscosity, the body has a difficult time reabsorbing it. It simply continues to build and forms large cysts. What do salivary cysts look like? In an affected animal, we see the salivary cysts in either of two places. Typically, a large pocket of saliva will form under the jaw at the base of the neck. It will initially be on the same side as the injured duct but after a brief period the cyst can become so large that it fills the entire area below the jaw. It feels like a thick-walled balloon filled with honey. The animal is able to breathe, eat, and drink in a normal fashion. Swallowing rarely seems to be impaired. The other area where cysts are found is within the mouth, under the tongue. They are referred to as a ranula in this location. These cysts often will cause problems with eating and drinking. They may limit normal movement of the tongue during drinking or get in the way when food is being chewed. What is the treatment for salivary cysts? Surgery is required in cases where saliva is leaking into the surrounding tissues. In those animals with a large fluid-filled cyst below the jaw, the salivary glands on the affected side are completely removed. Usually this means all of the mandibular and sublingual glands on one side. Although this may seem extreme, the remaining glands respond to the increased need and adjust their production to compensate for the removal. First, the cyst is opened, and the fluid is drained, then excess tissue is removed and the skin is closed. A second incision is then made over the main body of glands and they are removed along with a portion of the duct. This is easier said than done because of the many nerves and major blood vessels in this area. In cases involving a ranula, the surgery is much more simple. The ranula is opened and its walls are basically turned inside out and sutured down to the lining of the mouth. This creates an everted pouch that slowly heals, forming a new opening for the salivary duct. The salivary glands themselves are not affected in the surgical correction of a ranula. The important point for owners to recognize is that salivary cysts should be seen by a veterinarian as soon as possible. If the owner waits too long in a case of the cyst below the jaw, it is difficult for the clinician to determine on which side it originated. No one wants to surgically remove all the mandibular and sublingual glands from one side and then discover it was the wrong side. Help your veterinarian and your dog with an early trip to the clinic. Tonsillitis is an inflammation of the tonsils. The tonsils are part of the lymphatic system. Canines have two tonsils, one each located on the sides of the oral cavity at the rear. They are found within a fold of tissue referred to as a tonsillar crypt. When enlarged, they fold out of the crypt and are easily visible with the naked eye. As with other throat and mouth irritations, many dogs will be reluctant to eat and will drool excessively because swallowing is painful. Other dogs with the same condition will swallow repeatedly. The tonsils will appear enlarged and reddened. As in humans, tonsillitis is seldom serious; however, it can be chronic and annoying. The cause of the enlarged tonsils should be determined. Streptococcus or other bacteria frequently infect the area. Antibiotics are effective if bacteria are the cause. Foreign objects, such as sticks, lodged in the throat can also cause inflammation of the tonsils. Only in severe chronic tonsillitis of unknown origin should the tonsils be removed. The canine tonsils are lymphoid tissue and therefore important in fighting diseases. When possible they should be left intact.